Peace in the Middle East? Not if Benjamin Netanyahu has anything to say about it. The current standoff with Iran is an extremely useful way of distracting attention from the Palestinian issue, and a diplomatic breakthrough with Iran would likely shine more of a spotlight on Israel’s own nuclear weapons capacity. On Monday, 30 September, US President Barack Obama will welcome Israeli Prime Minister Benjamin Netanyahu to the White House for the first time in 18 months. Much has changed in the intervening period – both leaders have been re-elected, Obama has made his first visit as president to Israel, Israeli-Palestinian peace talks have been relaunched, and that rather pragmatic-sounding Hasan Rouhani chap has been elected president in Iran. That message will be viewed as a mixed bag in Jerusalem, which is keen for a greater American footprint in the region but is less enthusiastic about the idea of peacemaking with the Palestinians and deal-making with the Iranians taking top billing. For that reason, the upcoming White House meeting will likely find the two leaders back on familiar terrain, more focused on testing each other’s underlying intentions than on working together as close allies. The US president is something of an open book, but Netanyahu’s approach requires a little more interpretation and context. Too much of that analysis has been consistently wrong, and thankfully so. If prominent Netanyahu watchers had gotten it right, we would be marking the second or third anniversaries of Israeli bombing campaigns against Iran. Netanyahu is indeed back in threatening mode. His latest rhetorical flourish is to quote Hillel’s ancient maxim “If I am not for myself, who will be for me?” – an upgrade of his previous refrain regarding Israel’s “right to defend itself by itself”. That language is being widely interpreted by Israeli commentators as a reaffirmation of Israel’s willingness to strike Iran alone if Netanyahu’s red lines on Iran’s nuclear program are deemed to have been crossed. This debate has taken on a new urgency given the diplomatic opening seemingly created by the election of Rouhani. 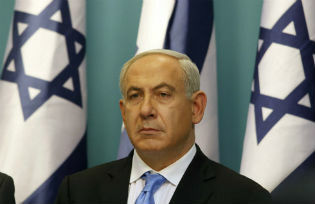 It is no secret that Netanyahu has been dragged out of his comfort zone by the possibility of a US-Iran rapprochement. Former President Mahmoud Ahmadinejad’s aggressive and insulting behaviour made him a convenient adversary for Israel; Rouhani and his diplomatic team, notably polished Foreign Minister Javad Zarif, present a challenge of a very different order of magnitude. Under these new circumstances, the nagging question for Washington policymakers is whether Netanyahu’s tough line on engaging the new Iranian reality is the wise approach of an understandably cautious and concerned Israeli leader, or whether this Israeli pushback is indicative of a more intransigent stance. The pushback has been nothing if not relentless: Netanyahu has called for an intensification of sanctions and military threats, has depicted Iran’s new leader as a “wolf in sheep’s clothing”, and has heaped scorn on the Rosh Hashanah greetings sent to the Jewish world from Iranian leaders’ Twitter accounts. The Israeli Embassy in Washington even crafted a fake LinkedIn account for Rouhani, which listed his skills as “weapons of mass destruction” and “illusion”. Sadly, the preponderance of evidence suggests that this is not just about Israel’s leader driving a hard but realistic bargain. If Netanyahu’s principal concern is really the nuclear file, he should be able to come to terms with the fact that a negotiated outcome offers the best long-term safeguard against Iran developing a nuclear weapon. The most that military strikes could achieve would be a short-term delay of Iran’s ability to weaponize its nuclear program – a decision that Iran has anyway not yet made, according to the consensus among Western intelligence agencies. A strike would also create a greater incentive for Iran to weaponize its nuclear program. At the moment, however, Netanyahu is signalling that there is no realistic deal that would be acceptable to Israel. For instance, a consensus exists among experts and Western officials that Iran’s right to enrich uranium – in a limited manner and under international supervision – for its civilian nuclear energy program will be a necessary part of any agreement. Netanyahu rejects this. If Iran is willing to cut a deal that effectively provides a guarantee against a weaponization of its nuclear program, and that deal is acceptable to the president of the United States of America, why would Netanyahu not take yes for an answer? The reason lies in Netanyahu’s broader view of Israel’s place in the region: The Israeli premier simply does not want an Islamic Republic of Iran that is a relatively independent and powerful actor. Israel has gotten used to a degree of regional hegemony and freedom of action — notably military action — that is almost unparalleled globally, especially for what is, after all, a rather small power. Israelis are understandably reluctant to give up any of that. Israel’s leadership seeks to maintain the convenient reality of a neighbouring region populated by only two types of regimes. The first type is regimes with a degree of dependence on the United States, which necessitates severe limitations on challenging Israel (including diplomatically). The second type is regimes that are considered beyond the pale by the United States and as many other global actors as possible, and therefore unable to do serious damage to Israeli interests. Israel’s leadership would consider the emergence of a third type of regional actor – one that is not overly deferential to Washington but also is not boycotted, and that even boasts a degree of economic, political, and military weight – a deeply undesirable development. What’s more, this threatens to become a not-uncommon feature of the Middle East: Just look at Turkey under Prime Minister Recep Tayyip Erdoğan, or Egypt before the 3 July coup, or an Iran that gets beyond its nuclear dispute and starts to normalize its relations with the West. There are other reasons for Netanyahu to oppose any developments that would allow Iran to break free of its isolation and win acceptance as an important regional actor with which the West engages. The current standoff is an extremely useful way of distracting attention from the Palestinian issue, and a diplomatic breakthrough with Iran would likely shine more of a spotlight on Israel’s own nuclear weapons capacity. But the key point to understand in interpreting Netanyahu’s policy is this: While Obama has put aside changing the nature of the Islamic Republic’s political system, Israel’s leader is all about a commitment to regime change – or failing that, regime isolation – in Tehran. And he will pursue that goal even at the expense of a workable deal on the nuclear file. Netanyahu’s maximalism does not represent a wall-to-wall consensus within the Israeli establishment. There is another Israeli strand of thinking – notably among retired security elites like former Mossad chiefs Meir Dagan and Efraim Halevy and former Shin Bet chief Yuval Diskin – that holds that the challenges posed by Iran can be managed in different ways at different times. Others inside Israel’s establishment acknowledge that the current period of unchallenged hegemony is unsustainable and that adjustments will have to be made. Some understand the efficacy of having an Iran more tied into the international system rather than isolated from it – a deal on Iran’s nuclear program, for instance, could also have its uses in limiting the manoeuvre room of groups like Hezbollah and Hamas. But Netanyahu has rejected these positions. The prime minister is nothing if not consistent: he was similarly intractable when the Palestinian leadership and the Arab League put forth pragmatic proposals. While the PLO’s leadership accepts Israel’s existence, the 1967 lines, and an accommodation on Israeli settlements (including in East Jerusalem) by way of land swaps, Netanyahu has shifted the goal posts – rejecting the 1967 lines and refusing to take yes for an answer. With the Arab League’s “Arab Peace Initiative” offering recognition of Israel and comprehensive peace in exchange for withdrawal from the occupied territories, Netanyahu is again following this pattern of rejectionism. Netanyahu is a deeply ideological leader with an unshakeable belief in a Greater Israel and regional hegemony. If this reading of him is accurate, it bodes ill for Israel’s reaction to the nascent diplomacy between the United States and Iran. In the coming weeks and months, Netanyahu will likely dedicate himself to derailing any prospect for a diplomatic breakthrough. In that mission he is, of course, not alone. He will be joined by American hawks and neoconservatives, Republicans who will oppose Obama on anything, and some Democrats with a more Israel-centric bent. Their efforts will be concentrated on escalating threats against Iran, increasing sanctions, and raising the bar to an impossibly high place on the terms of a nuclear deal. All this will serve – intentionally, one has to assume – to strengthen hard-liners in Tehran who are equally opposed to a deal. Of course, the Iranian forces ranged against Rouhani’s pragmatism do not need encouragement from Washington. But absent encouragement, they are not in the ascendancy – and crucially, Rouhani appears to have the backing of Supreme Leader Ali Khamenei for his diplomatic outreach. Currently, the difference among the three capitals – Washington, Tehran, and Jerusalem – is that only in Jerusalem does a representative of the hard-line faction, rather than the pragmatic camp, hold the most senior political office. If diplomacy survives this initial onslaught and the contours of a deal take shape, Netanyahu will face the choice that he has most wanted to avoid throughout his years in office: to acquiesce to a Western rapprochement with Iran or to stand alone in diplomatic and, presumably, military defiance. The ideologue in Netanyahu will counsel defiance, while the risk-averse politician in him will recommend a climb-down. If Netanyahu wants a way out from bombing Iran, he could simply declare victory. It would be an easy speech to write: Bibi would declare that it was only Israeli pressure for sanctions and a credible military threat that created the conditions for a nuclear deal with Iran. Even if Netanyahu is wrong on the details regarding sanctions and threats – they have often hindered, not advanced, progress toward a deal – the desired result will have been achieved. Netanyahu is not under Israeli public pressure to strike militarily or reject a deal. His security establishment is divided but wary of going solo, and even his cabinet is split on the issue. And this is why Monday’s White House meeting matters so much: while Obama retreated on the Palestinian issue when Netanyahu stared him down – first on settlements and then on the issue of using the 1967 borders as the basis for a deal – on Iran they have so far deferred their disagreements. But that option may be reaching its expiration date. The Iran issue is now more urgent, and if progress is to be made on either of the priorities Obama highlighted at the United Nations – Iran and Israeli-Palestinian peace – the president will need to become defter at outmanoeuvring his Israeli guest. Netanyahu’s calculations and his actions will be affected by clear signals from Washington, Europe, and elsewhere to stop undermining diplomacy, and making the case for the unrivalled benefits of a deal with Iran. After decades spent boxing in Tehran, the interests of global and regional security – and even of Israel itself – may now require a short, sharp burst of boxing in Bibi.